We can't believe that Color War 2016 is over, the event that occupied our lives for months is over. It feels like just yesterday that we started planning, and it all flew by so quickly. No matter what event we were planning during the year, we were always thinking about color war and how to make this one the best one yet. We worked on a schedule, created new games, chose our leaders and everything in between. Then it came down to the big decision - our theme. What message did we want to deliver? What did we want people to work on? What did we want the school to learn? We chose שלמות האדם, becoming a whole person so that we could fix the world around us. The world we live can be seen as a terrifying place, and it is our job to make this world a better place. But we can't fix the world until we fix ourselves. Rumi said, "Yesterday I was clever, so I wanted to change the world. Today I am wise, so I am changing myself." We wanted the students to be wise, not only clever. We wanted them to realize that they must change themselves in order to change the world. 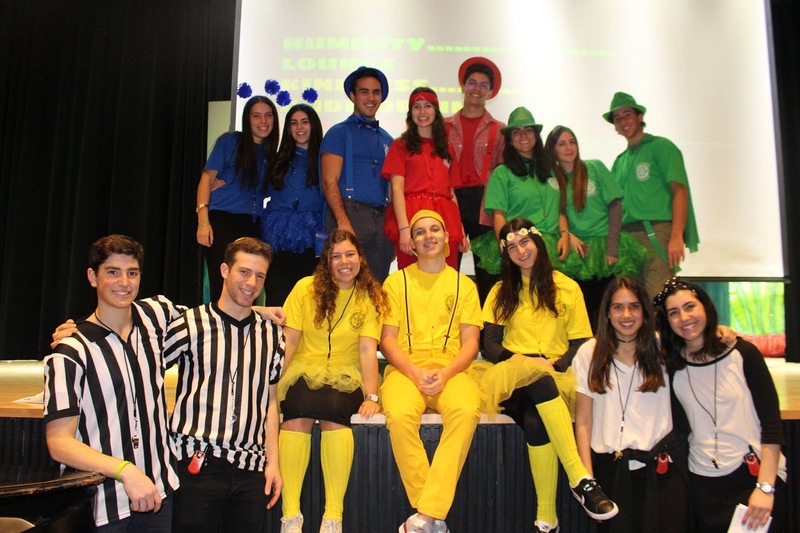 Our themes were Green Humility, Red Strength, Blue Justice, and Yellow Kindness - character traits that we should focus on and perfect in order to become more whole people. On Friday, March 25th we had our breakout. We started with late Minyan and a short play, then went into out breakout. Our breakout started with a video where Rabbi Levy announced color war. After he said those words, everyone went crazy. The Generals ran down the aisles to the stage, and their intro videos for their themes came on. After that we distributed the teams and sent everyone to their team times where the Generals introduced themselves and encouraged their teams to get involved and participate and help their team win. Saturday night were the team meetings, every team had a meeting by someone's house. That's where the brainstorming and the planning got started. Hundreds of students went and devoted their free time to making this color war incredible by contributing to artwork, dance, or music. The meeting went on until the wee hours of the morning. Then Sunday Morning everyone woke up bright and early for Sunday Morning Learning! Rabbi Kramer gave an incredible shiur about chesed and really inspired the students. After that the teams broke up and started working on the artwork for their hallways. I couldn't believe my eyes - students gave up their Sundays to be in school and help their teams. They worked on artwork, dances and skits, and then we had some sports competitions in the afternoon. The day was jam packed and we had to force people to leave the building at 11pm. It was a successful day and each hallway was more beautiful than the last. You could tell that the students put their heart and souls into it. Monday morning started with musical chairs at breakfast - it was intense. Then we sent everyone to class and showed two teams' Dvar Torah videos. For Monday we had Brain Games and Trivia planned for all the grades. Third period we played Brain Games with the juniors - games that challenged them mentally and demanded thinking. Then fourth period we had trivia and minute to win it with the seniors. After that we broke into team time for lunch. During lunch, we gave students the opportunity to get points for their team by reciting Boreh Nefashot, Al Hamichya, or Asher Yatzar by heart. It was incredible to how many students memorized these berachot for their team. Then during tenth and eleventh period we had trivia and brain games going on simultaneously for freshmen and sophomores. Everyone had a blast. After school we had a scavenger hunt around school and on Avenue J. Each team wrote questions for each other, it was challenging and fun. Then some people stayed in school to work on their artwork. Again we had to encourage people to leave at 11pm. Then it was Tuesday - our last day of color war. We started the day with blind folded musical chairs during breakfast. It was very funny to watch, but I don't know how much fun the players had. We sent everyone to class and showed the other two Dvar Torah videos. After that the day was pretty relaxed. We had team time during lunch, and again the opportunity to get points for memorizing berachot. Then the excitement came. We had fun games and marathon simultaneously during 7th period for seniors and juniors and 8th period for sophomores and freshmen. It was intense and so much fun. Then everyone made their way down to the auditorium for the closing ceremonies. We heard cheers and songs, watched skits, saw cakes and banners, and laughed at the boys trying to dance. The Generals then sang a nice tribute to Rabbi Levy while the SGO tallied up the points. There were closing speeches and everyone got emotional (or at least I did). We were saying goodbye not only to color war, but to our high school careers really. The work and the effort and the time we devoted since September. It all paid off. Color war was a giant success. So many people came over to me after and said that they were inspired. That the school was filled with these traits, and it was touching to know that all of the students and teachers really took this year's theme to heart. That people really want to take these traits and work on making themselves whole. I would say the winners, but it doesn't really matter does it? Alright fine, it was Blue Strength in first, Green Humility in second, Yellow Kindness in third, and Red Strength in last. But the winners aren't determined by their scores. The winners are those who gain from this experience and get inspired from what we worked so hard on. A special thanks to everyone who helped to make this color war so incredible. 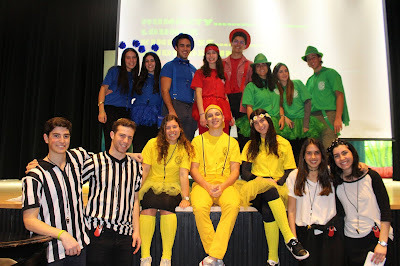 Rabbi Levy, Ms. Marcus, the Generals, the Lieutenants, the teacher Generals, the administration and everyone in between. Your devotion and your hard work made this color war one for the books. We couldn't have done it without you. We hope you enjoyed it as much as we did, and we hope that you all gained something from it. You all showed us your leadership qualities and you really inspired us! We are so proud of you and all of your hard work and are happy to see everyone united and working to become אנשים שלמים.